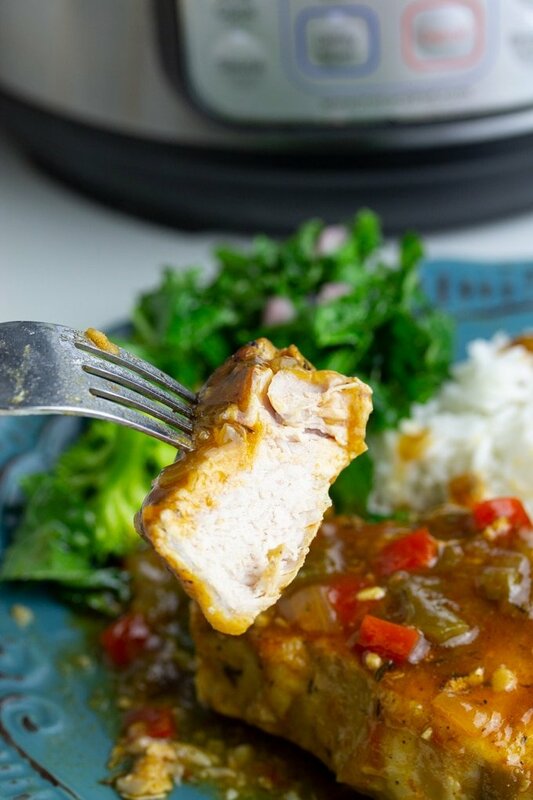 These delicious Instant Pot Pork Chops are cooked in the Instant Pot Electric Pressure Cooker and covered in a tangy delicious gravy that is full of flavor. 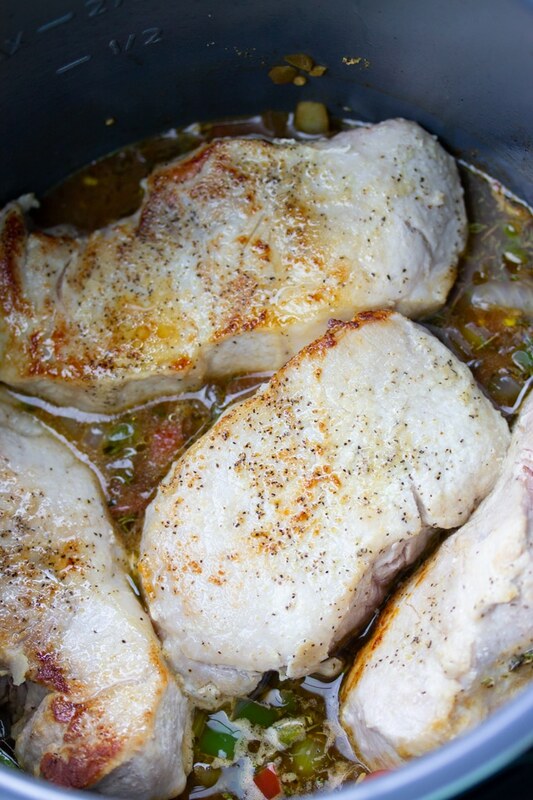 These pork chops are the perfect one pot weeknight meal. This post may contain affiliate links, please read my full disclosure here. recipe card at the bottom of the post. This pork chop recipe has been a family favorite for years. But initially, I made it in the oven and it called for my pork chops to be marinated overnight and a 1 hour bake in the oven. That’s great for me on Sundays but for weeknights, that just wasn’t going to happen. 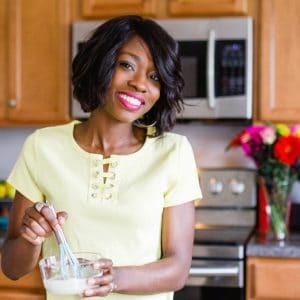 So I modified this family favorite recipe to my Instant Pot and I love it even more. Same great flavor, but less time and effort. 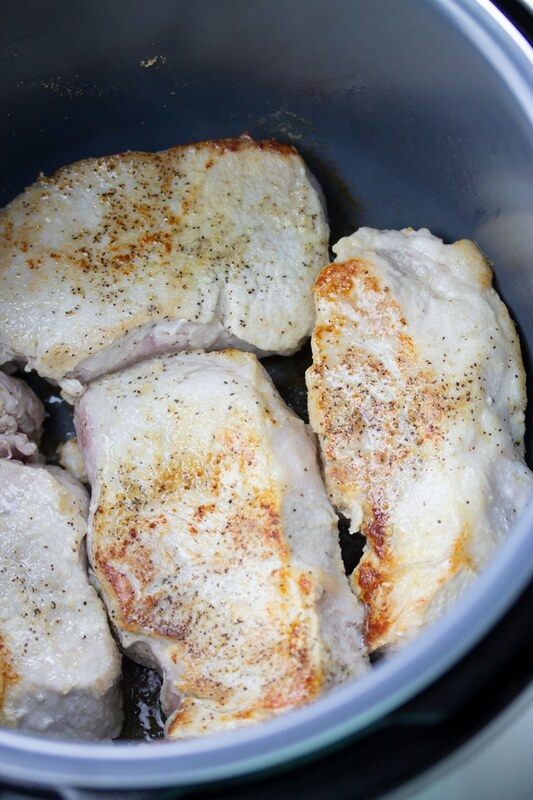 Can you cook pork chops in a pressure cooker? Thick cut pork chops cooked better in the Instant Pot. Thin chops tended to overcook and become dry or rubbery. 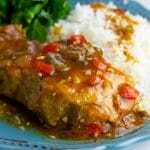 I always use thick cut boneless pork chops for this recipe. For thinner chops, reduce the cook time. Speaking of cook time, I found that an 8 minute pressure cooktime, 10 minute natural release for the perfect thick boneless pork chops. I initially tried a 10 minute cook time, and my pork chops were dry and overcooked. If you cook the meat too long, you risk having overcooked pork chops. I found 8 minutes was long enough for the pork chops to fully cook and stay moist. A 10 minute natural release worked best. A quick release is a no-no when cooking most meats in the instant pot. I let the pressure cooker naturally release for 10 minutes, then I release the remaining pressure. 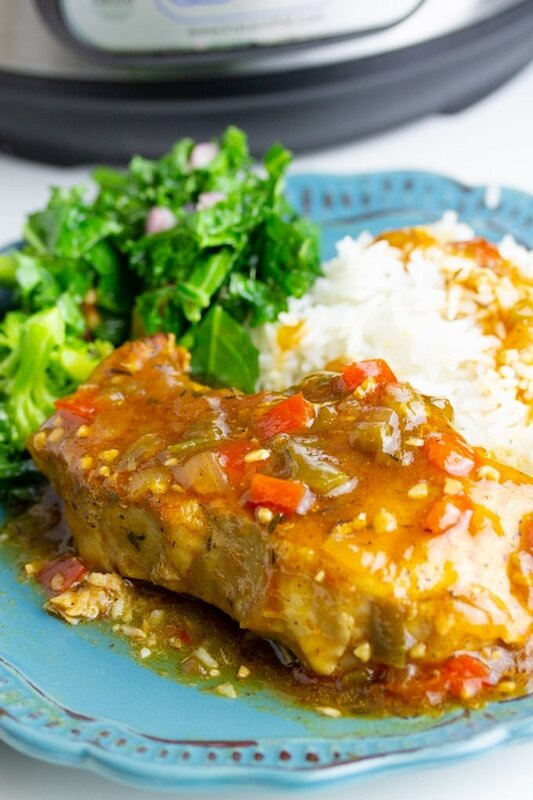 How to make this pork chop recipe in your Instant Pot? First, wash and dry your thick cut pork chops. Season both sides with salt, black pepper, and garlic powder. Press Sauté and select the “More” setting on your Instant Pot and wait for the display to say “Hot.” Then add your oil, then your chops. Sear over high heat for about 3 minutes each side, until browned. Once pork chops are seared, remove them and set aside. Then add butter to the Instant Pot and allow it to melt. 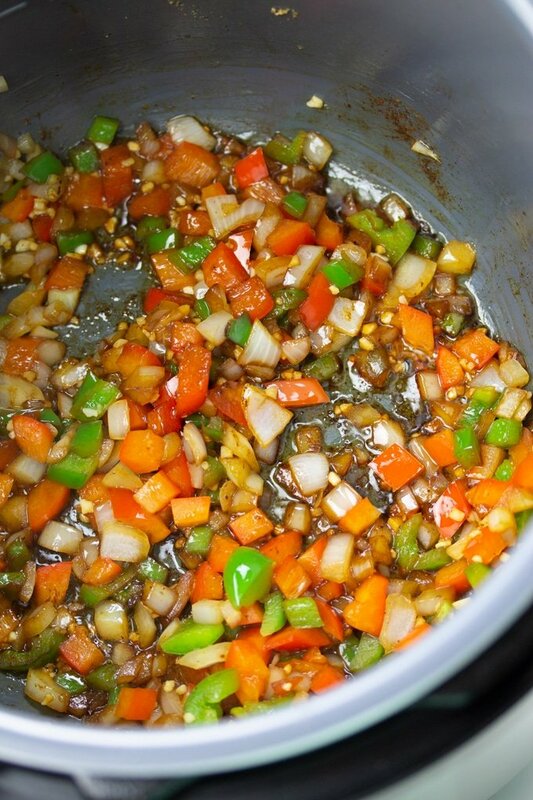 Add onions, bell peppers, garlic and stir with a wooden spoon until the onions and peppers have softened, about 2-3 minutes. Add chicken broth and use a wooden spoon to deglaze the Instant Pot, ensuring that all the brown bits have been removed from the bottom. Then stir in thyme, hot sauce, steak sauce, Worcestershire sauce, and ketchup. 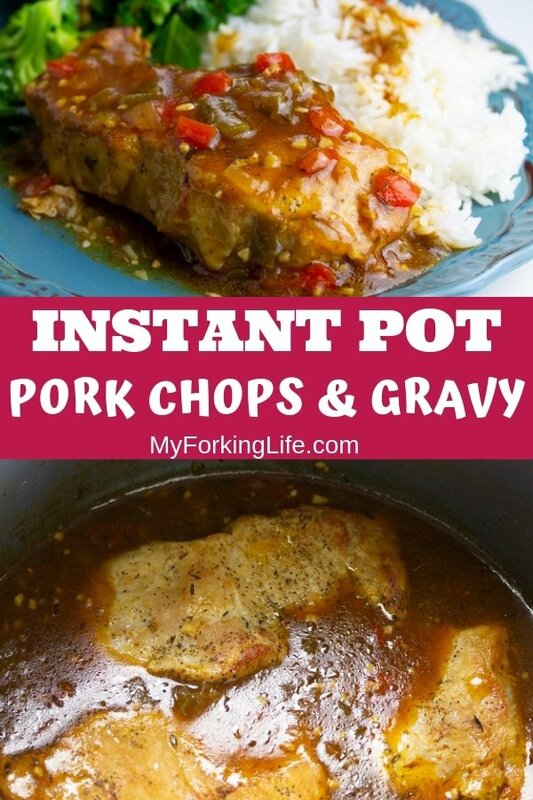 Place pork chops back in Instant Pot on top of the liquid. Press “Cancel” on Instant Pot and cover with Instant Pot Pressure Cooker cover. Make sure the valve on the top of the Instant Pot is set to “Sealing.” Then cook on High Pressure for 8 minutes. After the cooktime, allow the pressure cooker to naturally release for 10 minutes, then quick release the remaining pressure. Once all the pressure is released, open lid and remove cooked pork chops. Press”Cancel” on the Instant Pot and then select sauté. In a seperate bowl, whisk 2 Tbsp corn starch and 2 Tbsp water to create a corn starch slurry. Once the liquid in the instant Pot begins to bubble, add in your corn starch slurry to thicken the sauce. Allow it to boil for about one minute more. Press “Cancel” on your Instant Pot. Thick cut pork chops seared, pressure cooked, and smothered in a delicious gravy. Season the pork chops on both sides with salt, pepper, and garlic powder. Press the “Sauté” button, ensuring that it is set to “More.” Once the display says “Hot,” add the olive oil. Add seasoned pork chops and cook for about 3 minutes each side or until the sides are slightly browned. Remove from Instant Pot and set aside. Add butter to Instant Pot and allow to melt. Add onion and bell peppers and stir. Add garlic and continue to stir until onions have softened, about two minutes. Deglaze by pouring chicken broth into the pot and stirring with a wooden spoon, making sure to get all bits and pieces from the bottom of the pot. Add Worcestershire sauce, steak sauce, hot sauce, ketchup, and thyme and stir. Add pork chops back into the pot, laying them on top of the liquid. Place the lid on the pot and set the valve to sealing. Press "Cancel" and then press "Pressure Cook" (or Manual) and set cooking time for 8 minutes on High Pressure. Once timer is done, allow the Instant Pot to natural release for 10 minutes, then release any remaining pressure from the pot and remove the lid. Press Cancel on the Instant Pot and remove the pork chops. Press “Sauté” on the Instant Pot and bring liquid to slight boil. In a separate bowl, create a thickener by whisking together 2 Tbsp cornstarch and 2 Tbsp water. Pour it into the liquid in the Instant Pot while stirring. Stir until thickened, about one minute. This recipe was created in a 6 Qt Instant pot DUO. I will sometimes add an additional 1/2 tsp salt to the gravy after it's done pressure cooking. The amount of salt in the recipe will depend on the saltiness of the chicken broth you use. Tried this recipe?Mention @Myforkinglife or tag #myforkinglife! Super Tasty! I Keto customized it by using sf ketchup, and xanthan gum instead of cornstarch, and I skipped the hot sauce and steak sauce, but did add a little cayenne though. Sauce could have been a little thicker, but the flavour is phenomenal!!! I served it over cauliflower rice. Thanks so much for the feedback! I love how you made it Keto friendly too. What a fantastic way to cook pork! Love that you’re making use of the Instant Pot. Thank you. The IP is such a game changer for me. This is great. I got an Instant Pot for Christmas but have yet to take it out of the box. This sounds like a great way to test it out. I don’t have a good recipe in my arsenal for pork chops in my Instant Pot, yet. Looking forward to making this — love all of the flavors! So easy for a weeknight meal! That gravy sounds absolutely incredible too – yum!! These look amazing! 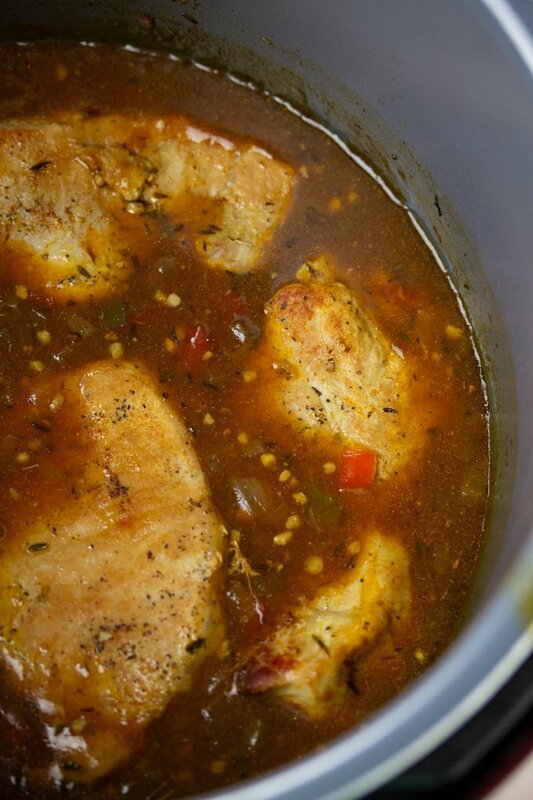 Pork chops are a fan favorite in my house – will have to try them in the IP with this gravy!! Yes! Hope you love them as much as we do.